Turns out Walmart decided to be beautiful and I'm not mad. 1. A clip corner chest with champagne-gold hardware — this is gonna be a purchase worth drinking to. 2. A Windsor rocking chair for people who'd love to ~rock~ a more classic aesthetic. 3. A wingback platform bed that'll be so gorgeous in your room it'll even make your bedhead look better. 4. An upholstered storage ottoman so useful and lovely it's sure to have good things in ~store~. 5. An adjustable sofa bed for sitting, sleeping, and looking hella chic in your studio. 6. A timeless block leg dining table your family can have dinner at from the time your kids are in high chairs up until they've finished high school (and probably years after that). 7. An industrial bookcase for avid readers who know their books deserve a lovely place to be displayed. 8. A contemporary glass top coffee table with an icy vibe that'll clearly make your room look all kinds of cool. 9. An accent chair with a down-to-earth vibe for making your beach house cozy...or making your regular house look more like a cozy beach house. 10. Or a floral accent table so you can add a botanical touch to your living space without actually taking care of something living. 11. A handmade velvet sofa with a smooth silhouette and subtle gold accents, which is sure to add real elegance any place you put it. 12. A set of four metal chairs you can use indoors or out — these are definitely a bright idea no matter where they end up. 13. An arch lamp that'll make it really hard to ~curve~ your enthusiasm over your home's sleek style. 14. A hutch desk with a crisp, clean design for any A-types out there who love a sharp desk. 15. An Italian leather tufted club sofa that's gonna be ~tuft~ to live without whenever you go on vacation. 17. A shimmering gold canopy bed that'll make your bedroom the kind of picturesque Pinterest inspiration you've been dreaming of. 18. A rounded drawer chest you're gonna keep around forever. 19. A platform bed with a unique look that will lift your spirits when you go to lie down. Stop ~hovering~ over the "add to cart" button and get it now! 20. A triangle top end table that is sure to be ~acute~ little addition to your living room! 21. A velvet chair with hairpin legs — you'll be on (hair) pins and needles until this is finally in your home. 22. A color-changing TV stand that is sure to be the light of your life (or at least your living room). 23. An accent stool you might not need, but your memory of why not is starting to get ~fuzzy.~ Probably because you actually need it. 24. A quilt-inspired accent chest that'll have anyone who loves color in ~stitches~ over this sweet piece. 25. A romantic handcrafted sofa with faux sheepskin pillows, a kiln dried solid wood frame, velvet upholstery, and a keyhole detail — this will certainly be the key to making your living room look perfect. 26. A clever twin bed, so your kiddo can have their own dream home inside your actual home. 27. A coffee table you ~wood~ not want to see your living room without. 28. 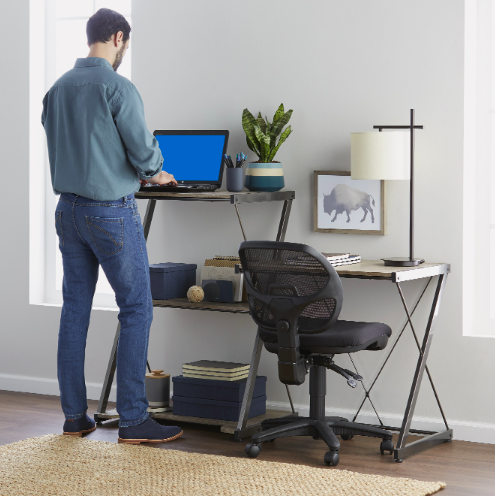 A standing desk shelf you'll love so much you'll want to give it a standing ovation. 29. A fiberglass bench so unique your friends will be ~green~ with envy over it. 30. Or a more traditional bench so you can sit back, take your shoes off, and relax in the mudroom for a moment. 31. A bathroom vanity so beautiful it'll remind you why it's called "vanity" in the first place. 32. A cocktail table sure to look ~wheely~ cool in your living room. 33. 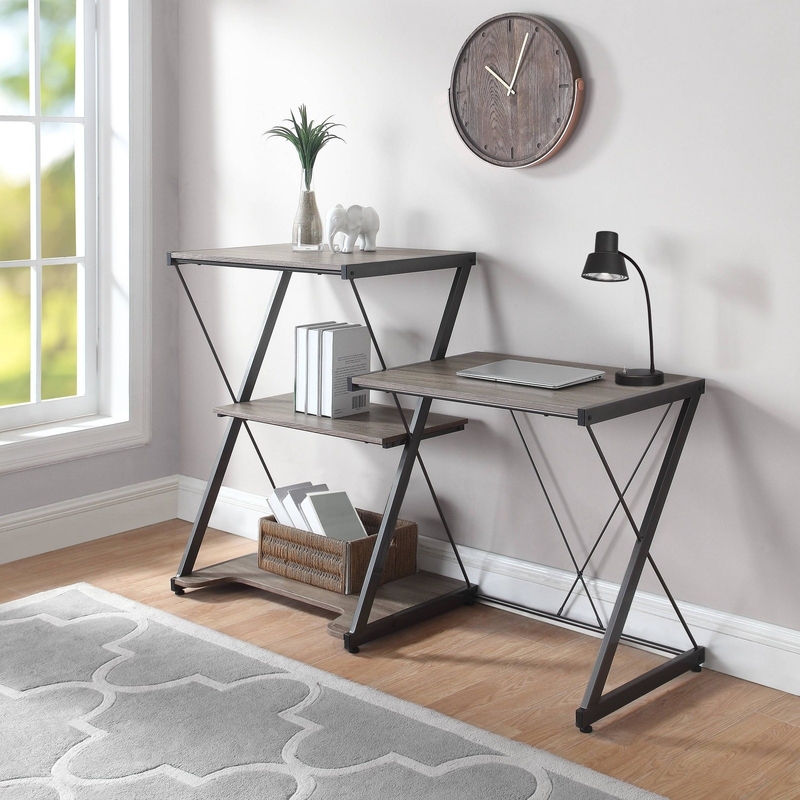 Or a tempered glass end table that'll put an end to your search for an inexpensive statement piece. 34. A metal loft bed — you're quickly gonna realize a nice style like this really ~lifts up~ a bedroom. 35. And finally, a handmade dining room table with coated steel legs and a solid elm wood top that'll be so fancy you'll almost feel bad eating just a plain bowl of cereal on it. When people ask where you got these.